Some books you just love, this is one of those books. I enjoyed this book so much, I recommended it to Sky (we favor different genres, so the book has to be high quality for us to recommend to each other ) and he loved it, too. 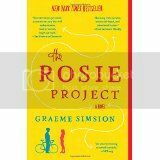 The Rosie Project by Graeme Simsion is a romantic comedy. The story is from the male protagonist's point of view, which you don't run into a whole lot in romantic comedies...and it is a great spin. The story is about genius genetics professor, Don. He is brilliant, but socially very awkward, making you wonder if he might be on the autistic spectrum. Apparently, his friends and colleagues wonder this about him, also. An early scene involves a friend asking Don to fill in for him, delivering a lecture on autism. The resulting experience is hilarious, I could not stop laughing through this part, and had to read it aloud to Sky...this was the point he decided to read it.... This scene played in my head as performed by Sheldon from "The Big Bang Theory" t.v. show, I wanted to call the show and tell them they needed to do this scene with Sheldon. So, the story centers around Don, deciding that it is time to look for a wife- and going about it in a very systematic way (imagine flow charts, scientific surveys and applications). Enter Rosie, who is the antithesis of Don's list of wifely attributes- who he mistakes as a "wife applicant" but who is really looking for help on a personal genetic project. The rest is sweet, hilarious and even has some mystery thrown in. Don really starts to grow on you, he really is a caring person, just a little "awkward" in his delivery. I loved, loved this book. 5 stars out of 5 stars! I read very fast, and I am always reading something. It is easy for me to enjoy something, but not easy to obtain 5 out of 5 with me, I really loved this story.